Everywhere you looked at Griggs Reservoir in Columbus on Saturday you saw Blake Haxton. His name was on a Vespoli 8+ raced by his alma mater, Upper Arlington High School. His competitive nature was on display in the side-by-side, 5,000-meter headraces that the regatta comprised. Blake himself shook hands, took photos and spoke with countless athletes, parents and spectators on hand for the fifth annual regatta that bears his name. A properly executed draw sets the stage for a clean extraction. 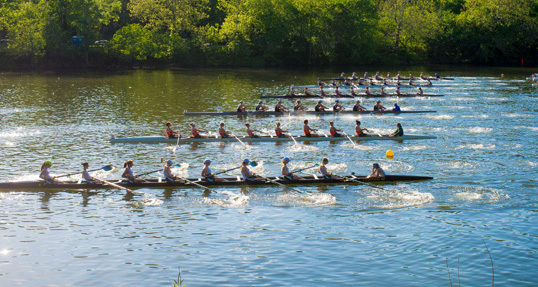 For coaches, selecting a coxswain can be harder than selecting the crew. No two coxswains are alike—each has his or her unique personality, experience, and voice. A sea change is coming. It’s something you’ve likely seen before, just in a different form. You’ve seen it in the evolution of every new idea, every innovation, and it shifts the paradigm just enough to let a breakthrough happen. For Paralympic rowing, this change is happening now, and when it is over our sport could wind up looking dramatically different than it does today. Get the picture with this training tip from Rowing Magazine. On the Square – The catch, like everything in rowing, is best done together. Photo of the U.S. Women’s quad. The November Project – How two former Northeastern University rowers started a grassroots fitness tribe. If you’ve ever suspected bowmen see the world a little differently, here’s your proof. Rowing’s top coaching minds share their secrets for squeezing every last bit of speed out of the boat. Remembering former U.S. sculling coach Igor Grinko.